The Harry Potter Quidditch Costume from Rubie's is a bit of a strange choice for a fancy dress outfit. It's not instantly recognisable as a Harry Potter costume and, as one Potter costume should be enough for anyone, surely the wizard costume will be most people's first choice. Having said that, it's good to see that Rubie's are actually making an effort to provide more than one choice of costume for Harry Potter fans. The hooded robe has the Gryffindor badge on the front, along with the player's name "Potter" above it. On the back it has the number "7" and "Potter" printed in yellow. 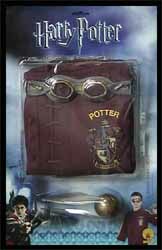 As well as the robe, there is also a pair of goggles and a Golden Snitch to complete the costume. Bearing in mind that most children will be running around bumping into things and falling over (as kids do) I was impressed with the fact that the goggles were made from rubber, with soft lenses. This means that you can let them run around without worrying about them doing themselves any serious damage. The costume itself is made from pretty good quality material, when you consider the price. Although, the warning on the label indicates that this is not fire resistant, so it's probably best not to get this anywhere near candles or the fireplace - especially with those long sleeves. This is a fairly good value for money costume, and one that Potter fans will appreciate.